“Me and the wife recently auditioned for the game show ‘Pointless’ and were sent a shortlist email 2 days after that audition. Unfortunately we never heard back from them, so about 3 weeks later I emailed one of the researchers who said we unfortunately not made the list to actually appear on the programme. “She did say that it was definitely worth auditioning again which we did last week. I’m getting a bit worried though as its now been exactly a week and we haven’t heard anything (no shortlist email 2 days later like before). “I’m beginning to lose hope, even though the researcher said you will hear within 2 weeks it seems this show shortlists contestants within a couple of days (as was shown in our 1st audition process). The short answer is that as with all TV shows, you can always receive a call from out of the blue if you applied. Even if you’re not first choice, circumstances can change and the production company may need to refer to their backup list of contestants. Also, it can be difficult to second-guess what the TV company is looking for at any given time. Producers are under pressure to fairly represent the ethnic, age, gender and regional make-up of the UK when casting for their shows. This means that at the time of any given application your personal profile may be the wrong fit. At the time you apply, the network may be specifically looking for more women from the North of England. They may be for more Asian faces. You can miss out this way and it can be nothing to do with your ability. Also, the ability of a contestant to project the right mood is usually far more important than their quizzing ability. Different shows will be looking for different characters. Bubbly is a good bet but some will also be looking for serious, wacky, intense, or even brutally normal. What the producers are looking for depends on the show and the time. It’s always a good idea to simply ask the researchers what they’re looking for when you apply or when you turn up to an audition. They’ll often be happy to tell you exactly what type of contestant they are hoping to find and you can adjust your behaviour accordingly. The other thing to remember is that if a show is very popular then you will have less chance of getting on. This is simply to do with supply and demand. So, the hope is there: unless you’ve been specifically told you are not required, you can be called at any time. Keep applying for shows and you’re sure to be on screen sooner or later. "Just to let you know that we appeared on Pointless last month. We finally got the call. I think my persistent helped. Again many thanks for your advice"
I added a a page of free pub quiz questions on plants. ...when I get a moment! Added: a new set of questions on everyone's favourite Far East superpower: China. Click here to go to the questions. "Respected Sir, I am writing quiz questions and giving it to an Indian Quiz site as 'Daily Quiz'. Till today I have not received money against my hard work. Please tell me a platform where I can reedem my hard work." 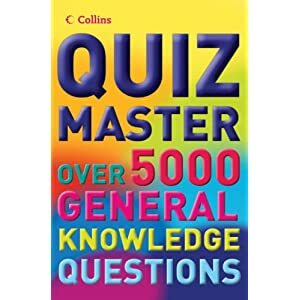 There are more than 6000 questions on this website and they're all free but if you want that kind of trivia power without having to turn on your PC or without having to trust your broadband connection to keep functioning, you might fancy getting it all in a book. 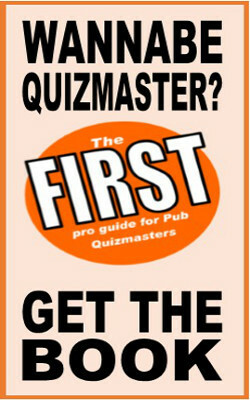 Quiz Master by Nick Holt claims to contain 5000 trivia questions in one volume. From my own personal experience of putting this site together, I can tell you: that is a bunch of questions. I haven't seen it myself but the reviews on Amazon are decent enough, although one reviewer complains that the questions are too hard for the elderly. I guess you can't have everything. Here's a nice little innovation for those of you running the less-serious type of quiz. I've been using Top Trumps for a long time at my quizzes to elminate contestants. I found this article with a few ideas about writing quiz questions based on the Alexa ranking of various websites. There are some decent ideas in the article, but remember to keep your questions up to date. For example, Facebook may well take over from Google as the number one site sometime this year. There's a good idea: do a walking otur for tourists or corporate groups and throw in a pub quiz as you go. According to the site, there are 12 of these walks per year, but it looks like these are perhaps concentrated into the summer, as the next one is on March 14th. Putting a decent quiz together is a pain enough, with haveing to translate it into another language. That's what they do at Beerlingual, a twice-a-week pub quiz in Buenos Aires, Argentina. Read more: Could You Write A Quiz in TWO Languages? Another contestant call has come through, mainly for those of you in the London area. Zeppotron Limited is making a brand new adventure style quiz show pilot for Channel 4 and are looking for contestants to take part. Auditions are in the capital only and the show is just a pilot but there is a £500 prize pot on offer.